HOBOKEN, New Jersey (WABC) -- Campaigns in the race for mayor of Hoboken are denouncing what they call bogus flyers about a Sikh candidate. 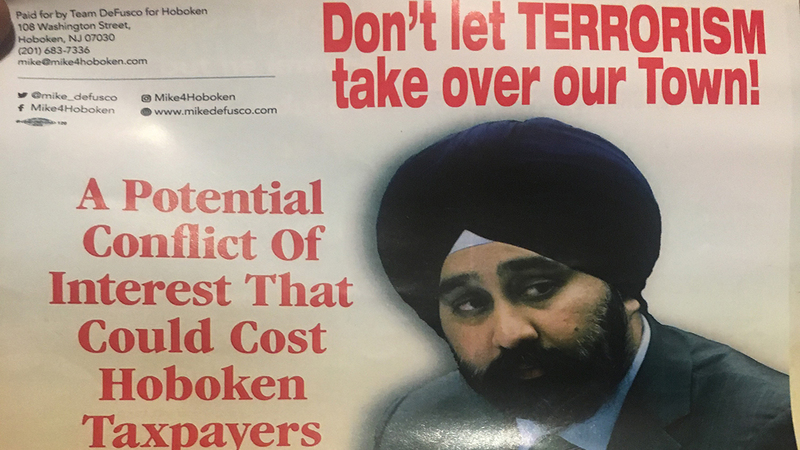 The flyer used a picture of the candidate, Councilman Ravi Bhalla, with the text "Don't let TERRORISM take over our town!" The flyer said it was paid for by a rival campaign, but a spokesman for the campaign of Counciman Michael DeFusco said it was not their flyer and they have alerted the Hoboken police. Bhalla released a statement on Twitter that read in part, "Of course, this is troubling, but I want to be clear: We won't let hate win in Hoboken. I want people to know that Hoboken is a welcoming community where my wife and I are proud to raise our two young children. " If elected, Bhalla would be the first Sikh mayor of Hoboken. In June, Hoboken Mayor Dawn Zimmer announced she would not seek a third term.